John Hughes admits he will make another foray into the transfer market in January in an attempt to bolster his Hibernian squad. On Tuesday the Easter Road side were knocked out of the Co-operative Insurance Cup by St Johnstone. "I'd like to think I could go and get one or two better players when the window opens," said Hughes. "But I'll never give up on these guys. I've got some good players and it's up to me to get the best out of them." Hibs have been inconsistent since Hughes took the reins at the Leith club from Mixu Paatelainen at the start of June. Defeats by Celtic, Hamilton and St Johnstone have been balanced by wins over St Mirren, Falkirk and Derek McInnes's Perth Saints. And the former Falkirk boss acknowledged that there will be highs and lows throughout the season. "I know what I've got at my disposal and it's going to be a rollercoaster ride," said Hughes, for whom Liam Miller and Anthony Stokes have been notable signings. "Will that bring us victories? Yes, it will. But will we also get beaten every now and again? Yes, we will." Hughes was hurting after watching his dream of making an early trip to Hampden for a Co-operative Insurance Cup final collapse in the 3-1 defeat by St Johnstone. "It kills you," he said of the cup exit. "But you just need to roll with it, take it on the chin, be bigger and better." 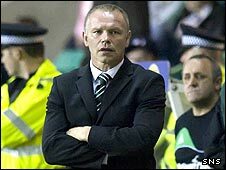 And in a message to the Hibs fans, he added: "Let me tell you, none of them will be hurting as much as me." Jim Gannon's Motherwell provide the opposition for Hibs on Saturday and Hughes has to decide whether to reinstate skipper Chris Hogg, whom he dropped after the defeat by Hamilton on 13 September. The same team who beat St Johnstone in the league last Saturday lost to Saints in the cup. "I'll give them the opportunity possibly of going to rectify it but I've got three or four other ones who are banging on the door to say, 'Come on, it's about time I got a chance'," said Hughes.